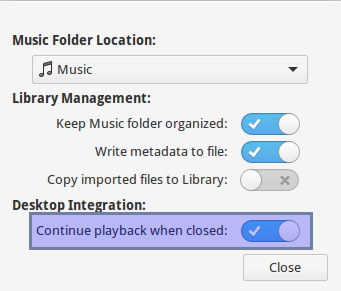 By default the Music player (noise) keeps playing if closed, as it has this option enabled by default. So closing means closing the GUI and losing access to its graphical options. What can the purpose of this be and how it is supposed to be closed in this case? By default, Music doesn't stop playing just because the window is closed. Very seldom will one actually want or need the window while Music is playing. In this way, Music is a bit of a service. There is an app that allows you fine grained control or you can control playback from the indicator or very passively from media keys, but the window is not required to be open taking up space and cluttering your workflow for you to have music playing or control its playback. If you want to stop playback, you can use the "pause" button. Closing the app while no music is playing will quit the app. Well... You can flip that setting off. Or when it's on, you just stop it from the music/sound indicator on the top bar. That should work in theory and that's what I do but maybe someone else has a better idea.